Early man realized that a partnership of sorts with dogs would be beneficial to both the human and canine species. Companionship, hunting, and even guard duties made dogs an important part of day-to-day living. To that end, your dog requires a proper shelter — a simple, yet practical retreat that will protect him from the elements. 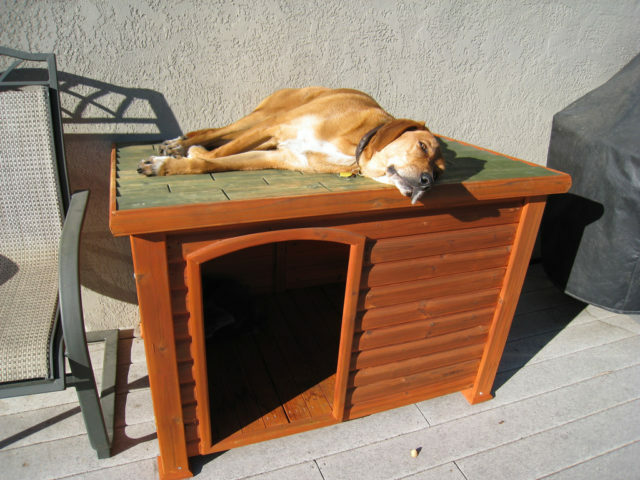 If your dog primarily resides outdoors, then without a doubt, a dog house is a must. If yours is an indoor dog, then a dog house will serve a slightly different purpose: a uniquely customized space for your four-legged friend to enjoy inside your home. The possibilities are endless when it comes to the types, sizes, and styles of dog houses to choose from. 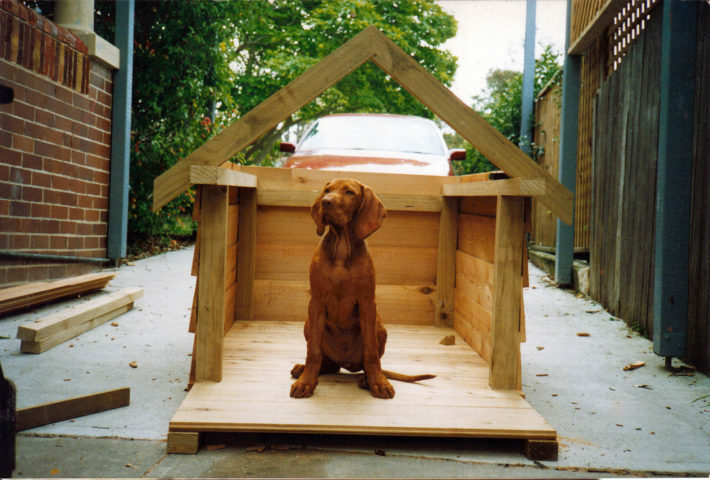 Here are some interesting dog house ideas — from practical… to fun… to fancy! Evolution of the lowly dog house has taken many different forms throughout the years. Check out this history of the dog house. In the early days, Egyptian nobility kept their hounds in mud-brick kennels. The dogs were cared for by professional trainers, even in these early times. By the 1800’s, it became common for individual dogs to have their own specifically constructed home among their human partners, as the family dog had become the mainstay of life. As with human housing, the evolution of the doghouse has taken on many different forms. To facilitate training, especially housebreaking. To provide a private, comfortable space for your dog, like a dog house does. For the budget-minded, or new dog owner, this isn’t a bad way to go. It’s practical, and frugal, and serves it purpose well. 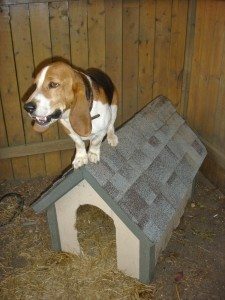 Later, after you’ve discovered your dog’s true personality and you’ve determined how and where your dog’s space fits into your family’s home space, you might consider getting a dog house that “fits” better or “looks” better. Many of the different shapes, styles and configurations of today’s dog houses are for purely aesthetic value. 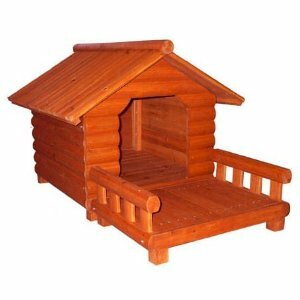 Some of the above dog house mansions are available from La Petite Maison Playhouses. Here’s an interesting look at dog houses that are fit for a king. Another popular variation is the rustic dog house. Rustic dog houses are both functional (for the dog) and pleasing to the eye (for the humans in the family). If you happen to live in a log home, or tend to vacation in a log cabin, then a rustic dog house would be a nice complement. A basic dog house is good, but practical with a purpose is better — even if that purpose is simply to not be an eye-sore. Plastic dog houses are the modern answer to easy portability and quick clean-up. There’s a look to please everyone’s style, home decor, and personality. Plus, unlike wood, there will be no splinters from chewing or scratching. Not to mention the fact that assembly is often a quick snap together process that requires little or no tools… or carpentry skills. If you have the space, a pop-up playpen for dogs may be a good option — especially if you have 2 or more small dogs. Most portable dog playpens can be used indoors and outside (for short periods of time and under supervision since they’re not super sturdy). The best part: they can be set up or taken down on the fly. So they’re great to take with you… to the park, when visiting others’ homes, camping, etc. Along those same lines, a dog tent can serve as both a portable dog house and a pet containment system in one. For use primarily outdoors, you might consider an outdoor dog pen. It’s not as portable as the pop-up kind. But since it’s sturdier, it will last longer. It’s another way to give 2 or more dogs a confined space to play for short periods of time. The dog cave may appeal to some — especially the men in the family who can appreciate the benefits of having a “man cave”. If your dog will be in the hot summer sun for long periods of time, then this portable dog house with a mesh bottom will keep your dog safe and cool for hours outdoors. It’s raised off the ground for even better air circulation. Plus, it won’t be in sitting in mud or water when it rains. The UV-treated fabric will keep the harmful sun’s rays off your dog, and the vented sides and top will keep your dog cool. For the dog who spends most of his time outside, but still needs some space to roam, these doghouses from the Dog Kennel Collection fit the bill. These dog kennels serve 2 purposes: (1) To provide a fully enclosed doghouse with protection from the weather, while (2) Eliminating the need to fence in your entire yard. 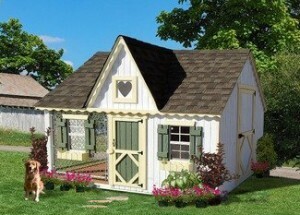 This environmentally friendly country barn dog house is ideal for those who are living green. It’s made from environmentally friendly, naturally insulating, insect- and weather-resistant fir that’s grown in sustainable forests. If yours is an indoor dog, then these built-ins for pets may fit the bill. You can create a unique space for your dog that blends into your current home decor. 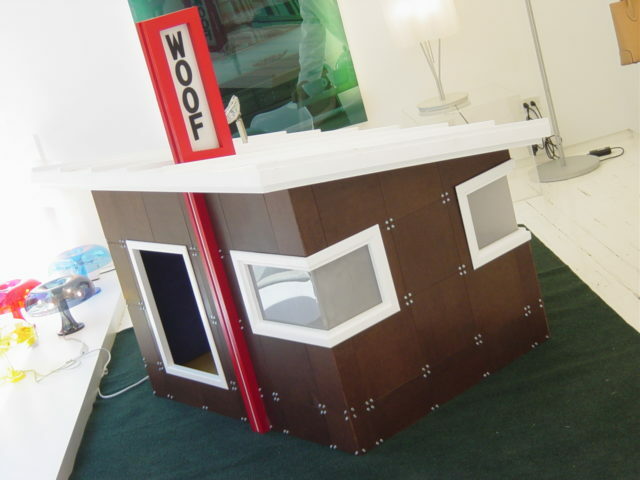 Along those same lines, you can even turn an old piece of furniture into a fun dog house! No matter which type of dog house you choose for your four-legged friend, just remember that even the most basic dog house can have an element of fun incorporated into it. A little style and personality never hurt anyone! A dog house door flap will enable your dog to go in and out of the dog house, while protecting the inside from rain, snow, and wind. To shield your dog from getting too much sun, you may want to consider a dog house windscreen and shade kit. Don’t overlook the importance of a dog bed or padding of some sort. Would you want to lie on a hard surface for long hours? Some dog houses have optional insulation kits available — like these Precision dog house insulation kits. If your dog stays outside, then you’ll need a good, quality outdoor dog water bowl that will withstand the elements. If you’re even a little bit handy, then you may want to build a doghouse yourself. No matter what, the primary purpose of a dog house should be to address the welfare of your dog. Size: It should be sized so that your dog can easily enter and comfortably turn around inside. At the same time, it’s shouldn’t be too big. Your dog should be able to curl up inside without so much extra room that his body heat will dissipate and leave him cold and uncomfortable. Dogs prefer dens that are cozy, rather than open and airy. Location: Choose the coolest, shadiest area of your yard for the location of your dog house. The more you can shield it from the sun, the cooler your dog will be, and the longer the dog house will last. It’s usually recommended that you situate the dog house so the doorway faces east in order to provide the most protection from approaching storms and strong winds. Materials: Wood is best. Plastic and metal can get too hot in direct sunlight and summer months. Be sure to drill several nickel-sized holes into the dog house walls to ensure proper ventilation. Otherwise, your dog will fry inside during the summer. Ventilation is also important in cold, winter months as well — to keep the interior dry, rather than moist. Flooring: If possible, build it so that the floor of the dog house is raised off the ground. Not so high that your dog needs steps or a ramp to get in — unless you want to add those unique features — but high enough that the dog house won’t be sitting in rain, mud, or snow. Plus, a raised dog house will keep your dog cooler in the summer (thanks to better air circulation) and warmer in the winter (since it won’t be next to the icy cold ground). Bonus Tip: The floor should slant slightly toward the opening, so melted snow and rain water from your dog’s coat will naturally drain out of the dog house itself. Roof: A sloped roof is much better than a flat roof, otherwise rain water, snow, and debris has nowhere to go. A flat roof will gather a lot of junk and ultimately wear out long before the rest of the dog house does. A hinged roof will make it much easier to clean the inside of the dog house! It’s also easier to clean and replace your dog’s bedding this way. For a custom dog house, you want it large enough so your dog is not cramped and there’s plenty of room to move around but small enough so that it will contain his body heat in cooler weather. The height should be the height of your dog, plus 9 inches. The length should be your dog’s length, plus 18 inches. The width should be your dog’s width, plus 12 inches. Before you build your own dog house, check out this video which breaks down the cost to build a dog house. It may help you decide whether you should build it yourself or hire a professional.